"CS-Touch Switch [CSHP]" was launched in 2014, as a “waterproof ” & “robust” switch. Robust structure: capable of striking the workpiece from all directions. 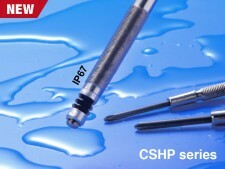 Until [CSHP] was born, no positioning switch could satisfy ”compact”, “robust” and “waterproof” at the same time. This development was a challenge to the “perfect switch” that can be used any environment.